There are plenty of lung diseases out there, and each can affect the sophisticated network of airways and tissue of your lungs in different ways. Chronic obstructive pulmonary disease (COPD) is a broad term used to describe different lung conditions, but most often involves chronic bronchitis and emphysema. Bronchitis, emphysema and COPD are all technically different diagnoses, but there’s a good deal of overlap. Learn what emphysema means, and how it will factor into your COPD management. 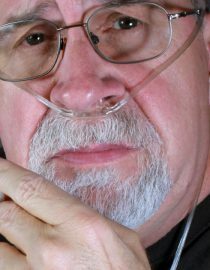 Is COPD the Same as Emphysema? Obstruction in the airways is often a big part of the problem, but your breath can also be obstructed at a deeper level, in the tiny sacs called alveoli. This damage to the alveoli is known as emphysema. Not every case of COPD involves emphysema — some COPD patients only suffer from chronic bronchitis (although both conditions are usually present to some degree). Therefore, emphysema is just one aspect of COPD, not the whole disease. Although bronchitis and emphysema often occur together (especially when tobacco smoke is involved), emphysema and bronchitis are different conditions. There are some important distinctions to keep in mind so you can treat each appropriately and get more relief from your symptoms. Emphysema targets the alveoli in your lungs, clusters of little pouches that inflate and deflate with each breath to move oxygen in and carbon dioxide out of your bloodstream. Healthy alveoli keep your cells and organs working well. Emphysema weakens these little sacs, and eventually, they begin to break down, leaving larger empty spaces. When a cluster of air sacs gives way to one big pocket, there’s less surface area to take in fresh oxygen, and stale air can become trapped inside. In turn, exhaling completely becomes very difficult. With chronic bronchitis, the mucus membrane that lines your bronchial tubes swells, thickens, and begins to accumulate mucus. As the inflammation worsens, the airways narrow and less air can pass through with every breath. Wheezing and tightness are sure to follow. Together with bronchitis, alveoli damage can lead to the characteristic cough, breathlessness, mucus and chest constriction that makes life so difficult for COPD sufferers. Experts suspect tobacco smoke can trigger a release of enzymes in some inflammatory cells, which might lead to emphysema. These enzymes break down the proteins responsible for keeping the alveoli stretchy and flexible. Once the alveoli lose their elasticity, they fail to move air in and out of the bloodstream. Your autoimmune system is your body’s first line of defense against dangerous invaders. Although more research is needed, there is some evidence that tobacco smoke aggravates your autoimmune system, triggering a harsh response — instead of targeting outside threats to your health, it starts to attack healthy tissue in your alveoli. Programmed cell death (known as apoptosis) is an important part of life: it helps eliminate old and unhealthy cells to make room for new cells. However, too much apoptosis — or misdirected apoptosis — can result in damaged tissue and disease. Researchers think cigarette smoke could encourage this programmed cell death in the alveolar cells. Next page: How to treat the symptoms of emphysema while keeping it from progressing, and more information about living with COPD and emphysema. The first and most important step in the battle against COPD and emphysema is quitting smoking for good, but there are other steps to help improve your breathing, too. Although the damage from emphysema is generally permanent, the choices you make and treatment you take can slow down the progression significantly. In many cases, oral medication is enough to keep the worst symptoms in a more tolerable range. The more severe the emphysema, the more likely you will need a combination of treatments to bring the symptoms under control. Advanced emphysema may not respond very well to oral medications, and in those cases, surgery may be the better option. Lung reduction surgery is the first step: by removing the dead tissue (where the alveoli have broken down into larger pockets), less air will become trapped and you’ll find it easier to push out that stale air in order to bring in a lungful of fresh air. In very serious cases, a lung transplant may be the only way to regain your breath. However, any organ transplant is a difficult procedure that brings a lot of risk. If there’s any way around it, your doctor will insist on trying that avenue first. The way you carry out your daily tasks and relax in your home can have a fairly big impact on your breath (or breathlessness). Adding wholesome foods to your diet and regular exercise to your routine will give your body the nutrients and energy it needs, but you must be careful to avoid some common household problems, too. You might also like...How Does Alcohol Affect COPD? Air quality differs drastically from home to home, and you’ll want to make sure yours is as good as it can get. Keep windows firmly shut when the pollen count or pollution levels outside are high, and consider getting at least one air purifier to keep in the area of your home you use most often. Clean weekly, and if your budget allows, have someone else do the dirty work for you. The irritants in household cleaners can provoke a respiratory response, and that’s the last thing you need when you’re already struggling with emphysema. Housework, cooking and simple errands can take more out of you than you might imagine. It’s important to get into the habit of taking lots of breaks throughout your day: plan your daily schedule carefully, allowing for downtime between each activity. Pulmonary rehabilitation can be immensely helpful for anyone with COPD. If you haven’t attended a therapy session yet, talk to your doctor about setting up your first appointment with a pulmonary rehab therapist right away. You’ll learn clever, straightforward techniques for better breathing, and the social and physical support you’ll receive is indispensable.